ap postal recruitment has given the notification for the recruitment of ap postal jobs. Candidates who are interested and willing for the ap postal circle jobs can apply for the job after reading the particulars. And here, ap postal circle recruitment online application submission starts on 01/02/2019. And also the application closes on 08/03/2019. Read the ap postal notification once or twice. 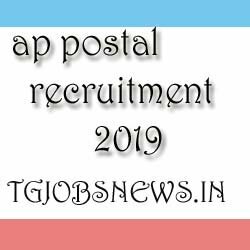 If you are confirmed that you are eligible for the ap postal recruitment job then you can go to the direct website link Click Here. If you are unable to read the full notification then here it is a simple way. We have already given the details of the post. The details which we have given are very easy to understand. So go through it. ITI or Matriculation from a recognised university or institution. 25 years is the maximum age limit. Rs.500/- for General and OBC candidates. Rs.100/- for the SC or ST or PWD candidates.